I love food. I love to eat. And pasta is definitely the way to my heart. That’s why I’m sitting at the gym typing this before I exercise for an hour. I need to counteract the extra calories somehow. When I first met Darren, he invited me to his house for dinner. With pasta and chicken on the menu, I was hooked immediately. We’ve been together ever since. Now, six years later, we’re always on the lookout for our favorite pasta or pizza restaurants. I found a local joint in Aliso Viejo too good not to share. Peppino’s is a pizzeria where you can get gourmet pizza such as Pizza alla Giuseppe made fresh to order. 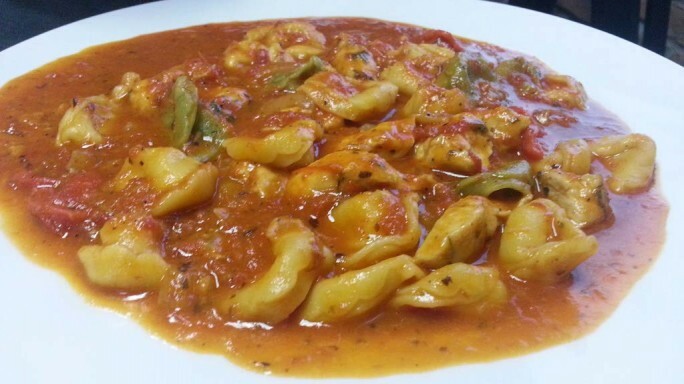 They also carry a variety of specialty pasta dishes that make a dinner choice very difficult. We dined there last night with Athena in tow and we were all prepared to lick the plate, although Athena is the only one that could actually get away with doing it. 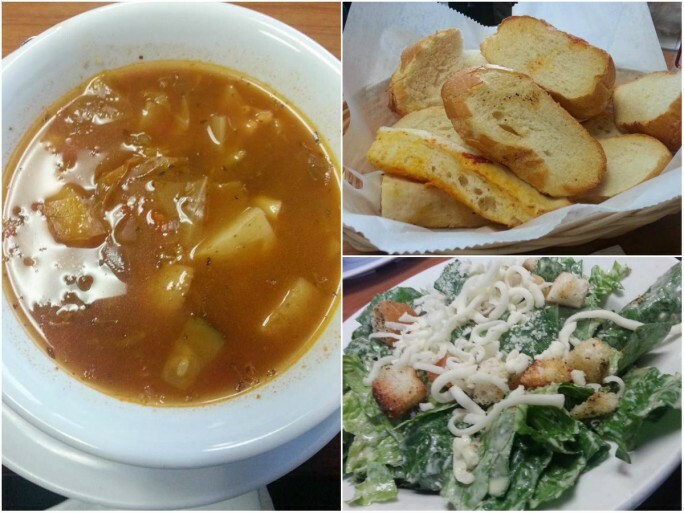 I hope you’re prepared to eat because after you see our meal, your mouth is going to be watering. Hot, fresh bread was delivered to the table as soon as we sat down at Peppino’s. Athena usually licks the butter off of the bread and then asks for more butter but the bread was so moist and delicious that she ate the first piece and asked for more. I was in shock as I handed her a piece without butter and she devoured it. I think she knows quality food already. I may have a problem affording her tastes when she gets older. Darren and I got either soup or salad as a starter with our entree so we ordered one of each. My Minestrone Soup was packed with vegetables, pasta, and beans. The vegetables were large chucks cooked to a juicy perfection. I considered keeping it all to myself, but when Darren offered me a bite of his Cesar Salad with fresh romaine tossed with house-made caesar dressing, mozzarella and romano cheese, and topped with seasoned croutons I couldn’t resist. With starters this good, we began to imagine the tasty pasta headed our way. 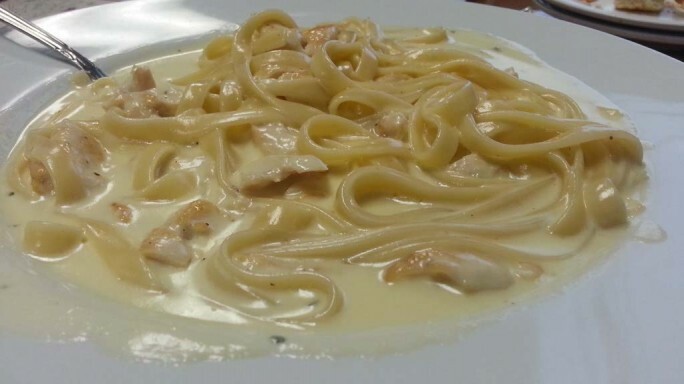 I ordered my typical Chicken Fettuccini Alfredo and Darren ordered Chicken Ferrenzano (chicken tenders sauteed with fresh garlic and onions in a red marsala sauce with romano and mozzarella cheese). Athena could eat spaghetti with meat sauce all day long so we didn’t mess with that. Each bite was packed with flavor from the home-made sauce and the chicken was cooked to perfection. I wonder how they get the chicken to stay so tender without being chewy or tough? No matter how many times I try to make Chicken Fettuccini Alfredo, my chicken or sauce will never compare. Maybe they’d be willing to share their sauce recipe if I continue going there enough. Once they know my name and see me on a regular basis, I’m going to ask. It never hurts. 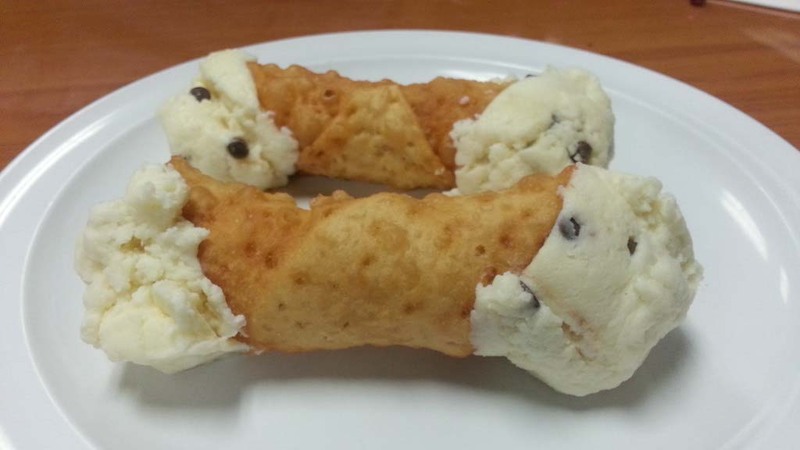 We finished off our Peppino’s meal with two Cannolis between the three of us. Normally I’m not a huge dessert fan and I’d rather get my calories from the main dish but when you go to Peppino’s, make sure you save room for dessert. It’s worth every creamy, delicious calorie. I can’t believe we’re only 5 minutes away from Peppino’s and it took us over 6 months to find the place. 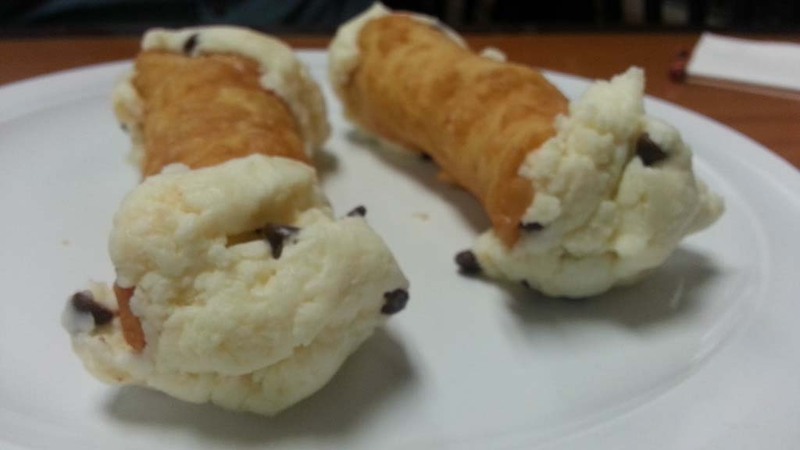 I can guarantee with pasta, pizza, dessert, and serve this amazing, it won’t take us another 6 months to return. I’d be surprised if we manage 6 days.